A typical character of the monasteries is that each monastery has a courtyard where main rituals in gathering are performed or yearly festivals are celebrated. The walls of stones which are inscribed with prayers and religious figures are called mani walls. On the outer walls one can notice the lines of ‘prayer wheels’. Prayer wheels are wood and metal cylinders with prayers written on the long pieces of paper inside. Every rotation of teach cylinder is equated to prayers written on the paper and are sent to Buddha. This is the reason that the pilgrimage keep on rotating the cylinders. There are also many Stupas (know as chortens). Stupas are are shrines containing relics of some religious significance. Small prayer wheels can also be bought as souvenirs in the shops. All religious instrument are sacred and are to be taken care with respect. Mostly inside the monasteries, the walls are decorated with paintings and thangkas and some of the monasteries also have a collection of precious manuscripts, many statues of Buddha as well as musical instruments and colorful masks which are used for ceremonies and at the time of festivals. Every monastery has many prayer flags on which prayers are written and they are fixed horizontal or vertical so that they have maximum exposure to wind and flatter at every blow of wind. The flags flattered by the wind - multiplied by the time prayers are written on them - are conveyed to Lord Buddha. These flags also pay an important role for the outer decoration of a monastery and create the religious atmosphere. In Ladakh, monasteries are traditional centres of culture, religious activities as well as of power. Monasteries are also owe big lands. The Monasteries in Ladakh earlier depended only on the donations from the villagers. Now most of them are charging a small amount as entry fee which is used for the maintenance and restoration work. The visitor should keep in mind that they are not visiting a museum but a religious place. Visitors are expected to wear dresses that do not expose their body too much. Visitors should remove their shoes before entering the monastery and should not eat, drink or smoke. The mural, paintings and other religious objects and decorative parts should no be touched. One should photograph only if this is allowed as per the Guidelines (like avoid flashlights). worth a visit. There are caves carved out of the mountain wall and some of the rooms are richly furnished with carpets, Tibetan tables and butter lamps. The village of Alchi is situated around 70 km from Leh on the left banks of the Indus river. The village has been described as one of the monastic jewels of Ladakh. The village Alchi differentiate itself from other villages of Ladakh by being so lush green. Now most of the small houses are made of bricks. You will be welcomed by a smile by the people in the streets. The main road at both side is covered by the Apricot trees. It is a normal sight to see the donkeys (Mules) laden with wares and building material during the summers when all the activities are at their peak. The Alchi region too received cultural influence from other areas. Alchi had contacts with Buddhism, Islam and Hinduism, however the Alchi’s isolation helped the village and the Gompa to keep their culture and traditions intact. Alchi was also on the main trade route of central Asia. The route along the Indus via Leh was connected to the Chinese Turkestan. The main centre of attraction in the Alchi village is the Alchi Gompa (monastery and temple complex). The Alchi monastery dates back to nearly one thousand years and so the effect of the Tibetan influence can be seen in the local culture. Since last 500 years, the religion is not practiced in the Alchi monastery. Over a period of time the Yellow hat sect (Gelugpa) shifted the religious activities to another place which is 30 kms away, known as Likir. The surrounding of the Gompa offers a very friendly atmosphere for the visitors as there are small restaurants, tea stalls and as well as souvenir shops welcoming the tourists. The visitors who have a very less time to visit Leh can have an excursion to the Alchi monastery. The nearest airport is located at Leh, about 70 km from Alchi. Alchi is situated about 541 km from Manali and 364 km from Srinagar. During peak season, some of the guesthouses operate in Alchi. Alternatively, accommodation can also be booked in Leh. The monastery of Hemis is situated on a green hill, surrounded by spectacular mountains. Hemis is situated around 45 kms in the south of Leh on the west bank of the Indus river. The Hemis monastery is the biggest monastery of Ladakh. It is not visible from the road as it is located in a side valley. The monastery is decorated on all the four sides by the colourful prayer flags which flutter in the breeze and send the prayers to Lord Buddha. The main building has white walls. The entrance to the complex is through a big gate which reaches to a big courtyard. During the festival time, the religious dances are performed in this courtyard. The stones of the walls are decorated and also painted with the religious figures. On the north side there are two assembly halls which are accessed by the stairs. As in most of the monasteries one can see here also the guardian deities and the Wheel of Life. Both of them are in good condition. The Hemis monastery also has an important library of Tibetan styles books and a very impressive and valuable collection of thangkas. One of the largest thangkas is also displayed every 11 year during the festival time. Hemis can be visited from Leh comfortably in one day if one is traveling by car or jeep. Hemis High Altitude National Park is another attraction in Hemis. The park covers 600 square km and contains some rare species of flora and fauna. Snow leopard, ibex, Bharal and Shapu are some of the rare and endangered species. 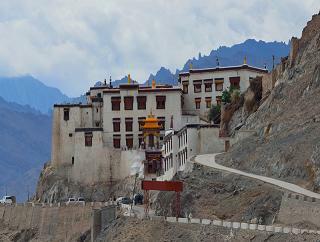 The Phyang monastery is located around 6 km away from the Srinagar-Leh highway and around 20 kms. from Leh, the capital of Ladakh. The Phyang Gompa (Monastery) is a traditional monastery of Ladakh and is famous for its spectacular religious festival with masked dances. This monastery being on the hilltop resembles quite like the monastery of Likir. The Phyang Monastery was built in the 16th century and belongs to the Red Cap sect. The festival of Phyang is called Tseruk' and falls on the 2nd and 3rd day of the 6th month of Tibetan Calendar. 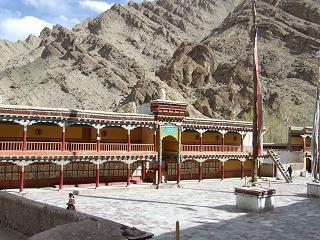 The Phyang Monastery was the first monastery, which introduced the Degungpa teaching of 'Skyob Jigsten Gonbo' in Ladakh. These teaching were introduced by Chosje Danma Kunga, during 16th century AD as King Jamyang Namgyal ruled. Another attraction of Phyang is the museum. This ancient 900 years old museum has a spectacular collection of Chinese, Tibetan and Mongolian articles including fire arms and weapons. After a recent renovation the monastery is worth visiting. Travellers can also make a visit to the Phyang lake just a few kilometers away. Shey is the oldest capital of Ladakh from where its earliest Tibetan kings ruled. 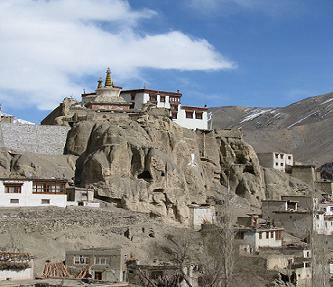 The Monastery or Gompa of Shey is located ideally on a high rock about 15 kms. south of Leh on the eastern banks of the Indus river. Until the 16th century, Shey was the royal residence. One of the attraction of the Shey is the victory stupa which is topped with gold. As there was attack from the Dogra military the royal family moved to Stock in order to escape. Much of the palace and fort have fallen into ruins. But on the eastern side there are extensivea large number of chortens. The Gompa of Shey along with Thikse is regarded as an auspicious place for cremation. The palace Gompa has a 12 meter high Maitreya Buddha (Buddha of future) which was commissioned by Senge Namgyal. This figure is made of copper and brass and glided and studded richly with precious gem stones. As the Shey monastery is not grounds with in regular use, it is opened only in the early hours, normally from 07 till 09 AM. It is advised to leave early from Leh to visit the Shey monastery without being under time pressure. The palace museum of the Shey has collection of beautiful royal costumes and jewellery, rare thangkas (Thangkas are religious themes and icons painted and embroidered on cloth), porcelain, jade, weapons and armoury. king Gragspa Bumide he converted it to Gayluk Pa order. Many icons of Buddha and 5 thangkas can be visited in this 15th century monastery. There is also a collection of ancient masks, antique arms, and an inspiring image of Mahakala. Every year, on the 17th and 19th day of the 11th of the Bodhi month, the Gelukpa order of monks celebrate the festival of Spituk known as Gustor. During the festival, the lamas wear the masks of religious deities and perform the dances, which is normally about good and evil and mythological stories related to the Buddhism. Stok is situated about 10 kms south of Leh, on the west banks of the Indus river and close to the Choglamsar bridge. Stok is more a Palace than the monastery. This royal palace was built in 1825 by king Tsespal Tondup Namgyal as there were invasions by the Dogra forces. The last kind died in 1974. The rest of the family including his son continued to use the palace and the prince was coroneted soon. Stok Palace has now become the home of the erstwhile royal family. The Palace Museum at Stok has wonderful royal thangkas, royal crowns, dresses, coins, precious stones and turquoise head dresses (still used by Ladakh women as their traditions). The visiting hours of this museum is from 0700 – 1800. Thiksey Monastery is situated about 17 kms. from Leh. It is a old monastery which is around 600 years old and at the same time one of the largest monasteries of Ladakh. As most of the monasteries in Ladakh, Thiksey is also situated in picturesque surroundings on a hill-top. The location of the monastery offers grand view of the Sindh Valley below. The monastery has around 10 temples which are full of interesting figures and other religious objects. Around 100 monks of the yellow hat sect reside in this monastery. Just after the main entrance one can see a large statue of Buddha. This Buddha statue was constructed under the guidance of the present local head lama. This statue is 15 meters tall and was built in the year 1980. This statue of Buddha is the largest Buddha figure in Ladakh which took four years to built. The statue is made of clay and covered with gold paint. This wonderful Buddha statue was made entirely by the local craftsmen and represents Maitreya (the Buddha of future). The walls of the monastery is full with the religious figures, murals, Tibetan calendars and with the wheel of life. There is also a prayer room which contains many books, some of these books are handwritten or painted. Block printing is a recent modern addition to the hand written work. In the main prayer hall there is a image of Sakyamuni (the past Buddha) with two Bodhisattava. This image is one of the main attraction. On the left hand one can see the image of the eleven- headed Avalokitashwara (a form of Buddha). On the roof top of the monastery there is a temple which can be visited only by men. On the top floor there is also a library which contains numerous volumes of Kangyur (Buddhas teaching) and Stangyur (comments on Buddha's teaching) texts. Above the temple there is a narrow room used as classroom of the school which also belongs to the monastery. Main religious Lamas here are the teachers who teach the children Buddhist religion and in future some of the children would be selected to become lamas. Earlier it was a tradition in Ladakh that the families would donate one son, normally the elder one, to the local monastery to become the lama. But, in these days, however due to the impact of modern life this tradition has almost disappeared. During the festival of Thiksey monastery, the religious dances are performed. These dances are known as Cham or mask dances. These colourful Cham dances are an important part of the Buddhist culture. In these dances, important religious stories are told and the victory of good over devil is celebrated. This is also an annual occasion for the villagers to be together. These festivals are related to other social activities like planning the marriages etc. 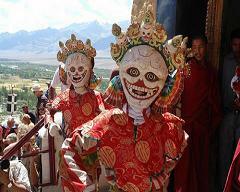 The festival of the Thiksy monastery takes place every year on the ninth months of Tibetan calendar. Thiksey Monastery is also known for making the Mandalas. At the Thiksey monastery, the Lamas make Mandala three times in a year. Natural colours like the powder of the crushed stones are used. The specialty of the Thiksey Monastery is sand Mandala as it may take many days to produce them and once finished they put the sand in the water which symbolizes the cycle of life. The Thiksey monastery community has a school which is run by the monastery management. It not only includes the knowledge of Buddhism but also other subjects including the computer operation are taught. Children from poor families are provided free education. The Monastery also take care that the children and other lamas have food as well as medical assistance.